Delray Rawlins has left Eastbourne Cricket Club and signed for Sussex Premier rivals Brighton ahead of the new season. 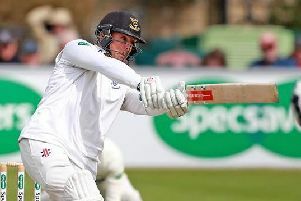 The Sussex allrounder has featured for Eastbourne for the past three years around his Sussex commitments but this campaign the Bermuda international opted to leave the Saffrons for Brighton. Eastbourne chairman Ian Fletcher-Price said, “Delray is a great lad and we wish him well for his career. He lives in Brighton now and his mates are over there too, so I guess that’s the reason behind his decision. Eastbourne travel to Mayfield this Saturday for a friendly fixture at the Wellbrook Ground. Their first Sussex Premier League is on May 4 at Horsham. Bermuda have included the talented 21-year-old in a training squad for the ICC Americas T20 Qualifier to be held on the island from August 15 to 25. Bermuda will play in a four-nation qualifier with the United States, Canada and Cayman Islands for the right to reach the final global qualifier in the United Arab Emirates from October 11 to November 3. Six countries from that 14-team qualifier will reach the T20 World Cup in October 2020 in Melbourne, Australia.